I have a confession. I diagram everything. I think it has something to do with the way my brain is wired but I am always pulling out a sketch pad whether I'm trying to understand some complex client problem or simply explain to my kids the difference between a phillips and a slotted screwdriver. An offshoot to this diagram fixation is that I like to include them with just about anything I write or present. As a trial lawyer, I have personal experience that a few good diagrams can help the jurrors and judges understand exactly what it is I am trying to explain. It is needless to say that when switching over to Apple one concern I had was "how am I going to continue making brilliant diagrams?" I knew with the OS X interface there had to be a program to meet my needs and indeed I have found it in OmniGraffle by the Omni Group. 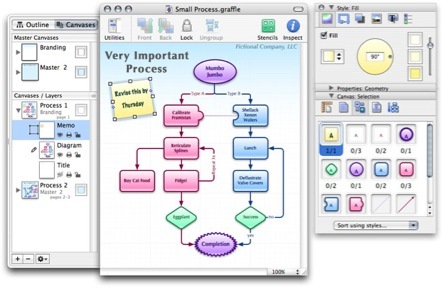 OmniGraffle is a diagramming application used to create simple diagrams, flow charts, and illustrations. What I really like about this program is the way it combines powerful diagramming tools with a simple interface. It has a streamlined set of inspectors that, after spending some time learning, make it very easy to alter just about every parameter of my diagrams. It also has a unique set of "Palettes" which are pre-defined objects you can simply drag and drop right onto your diagram. Out of the box, OmniGraffle has multiple sets of Palettes but there are even more on the Omni Group website. These include such things as logic flow, idea mapping, website planning, GUI planning, architecture, and a host of other subjects. There are also several websites with many professional looking user created sets of palettes. I found www.graffletopia.com particularly good and it is now on my RSS feed. In addition to the palettes, there is also a robust set of drawing tools. One nice feature is the ability to double-click on a tool in OmniGraffle Pro's tool palette and it stays active for multiple creations. When creating complex diagrams you can create them in multiple layers which is really helpful to me when explaining complex concepts. Related to layers, are canvases, which are somewhat akin to separate pages for related diagrams. With OmniGraffle Pro you get an unlimited number of these which allows you to go crazy with related diagrams. OmniGraffle takes full advantage of Mac OS X's Quartz graphics layer. This allows for antialiasing, smooth scaling, transparent drop shadowing, and other features. It also allows for Bézier shapes although the Bézier tool is not particularly easy to control with any degree of accuracy, but it is fine for the diagram work I do. Often I make adjustments or additions to my charts as I get closer to presenting them or exporting them to Keynote. With my old software this was always a pain because then you would have to re-align all of the arrows and lines attaching everything. This is not the case with OmniGraffle. The program "magnetizes" the lines and arrows to stick to the object you attach them too. I can drag boxes and objects around the screen and everything stays attached unless, of course, I tell them to unstick. It also has tools to allow me to adjust precisely where on the object these lines and arrows stick. An interesting feature is the ability to create hotlinks on the diagrams themselves. This allows me to click an object on a diagram that brings up a separate object. I use this to link pictures and pdf's that relate to my work files but it also could link websites, video, music and just about anything else on your Mac. If this isn't enough it works with OmniOutliner allowing me to import an outline as a framework for a diagram. Once your masterpiece is completed, OmniGraffle can output to PDF, TIFF, PNG, JPEG, EPS, HTML image map, SVG, PICT vector, Photoshop and BMP bitmap documents. With OmniGraffle Pro, there is better support to import and export to Microsoft Visio. The Pro version also gives you the ability to merge objects and other advanced tools. I spent several weeks using this program and strongly recommend taking advantage of OmniGroup's support tutorial and sample documents as well as some of the great user created webcasts to help you learn to take full advantage of this powerful program. Realistically it took me about 3 hours to really get my arms around it. Time well spent in my case. OmniGraffle costs $79.95 and OmniGraffle Pro costs $149.95. These programs aren't cheap but if you have a need of a diagraming application, they are well worth the investment. You can download a free trial at the company's website and try them for yourself. I am so pleased with this program. It is well designed and easy to use, once you get over the moderate learning curve. Best of all, my diagrams have never looked better or more convincing.